Rest and relaxation comes easy at the ultra-modern Samara Villa. Set away in a secluded location in Lipa Noi, you’ll feel like you’re miles away from the crowds - even when a variety of island attractions are easily within reach. A full range of amenities and entertainment systems, along with impeccable service offer an incredible experience for days when you decide to stay in. All five bedrooms at Samara wrap around the compound’s sparkling 20-metre pool. Each of the three master bedrooms feature walls that slide out towards the pool deck. In addition to offering direct access to the pool deck, both guest bedrooms also overlook the ocean. All rooms are kitted out in a full range of modern amenities like a 32-inch LCD TV, built-in wardrobes, personal safes and en suites with rain shower alcoves. Four of the bathrooms are equipped with freestanding terrazzo tubs. Island living is a real pleasure at Villa Samara, thanks to its beautifully landscaped grounds filled with tropical flora, sea facing private pool and wooden deck outfitted with sun loungers. With direct access to the coast, you’re just steps away from enjoying an afternoon of beach time. Sit back and relax with your favourite cocktails at the swim-up bar at sunset, and follow it up with an al fresco dinner in one of the open sided salas. Play your song list through speakers connected to the villa’s state of the art sound system to create the right ambience for your dinner party. Leave your little ones to play free in the indoor playground. It’s built in a private garden away from the beach, and comes complete with security cameras and smartphone access, so parents will feel at ease. Thoughtful design touches, like the convenient layout and open walled rooms let guests wander barefoot between the bedrooms and common areas while enveloped by stunning ocean views. The main living pavilion, set behind the pool features an open plan upper floor lounge, dining area and fully equipped kitchen. Lofty ceilings creates a sense of spaciousness in the lounge, which comes furnished with an L-shaped sofa, 65-inch LCD TV, Bose surround sound system, satellite TV and a hard drive stored full of movies (perfect for movie marathon nights!). Floor to ceiling glass doors allow sunlight to cascade in, and offer easy access to a sun deck overlooking the pool and beach. Meals are enjoyed at a 10 seater dining set, and served by a well-equipped guest kitchen complete with breakfast bar, built-in oven and double fridge. A second main kitchen, located on the same floor is where staff prepare meals from the in-villa suggestion menu. Private chef, airport transfer, security and housekeeping are included with your stay. For an unordinary villa dining experience, ask your private chef to prepare a special menu (available at additional cost). Laundry, spa and nanny services are available at additional cost. 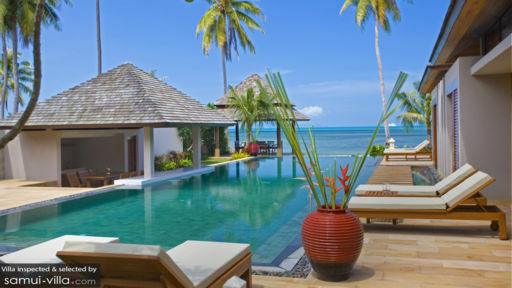 The tranquility of south Samui offers a respite from the bustle of its more popular beaches and tourist hotspots. Quiet beaches stretch out along the coasts are shared among few beach-goers, and are ideal for long beach strolls. 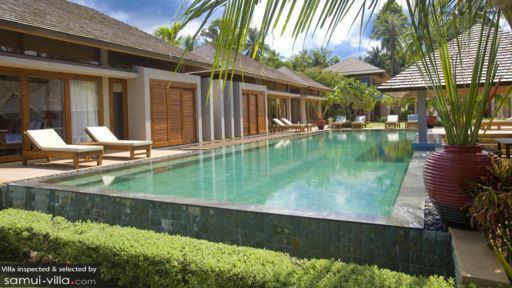 Lipa Noi Beach is a skip away from your villa, while Nathon Beach and Nikki Beach are five to 10 minutes’ drive away. Nathon Night Food Market, with its lively atmosphere and myriad street food fare is seven minutes’ drive from your villa. Other attractions in the vicinity include Na Muang Safari Park (20 minutes’ drive), Secret Buddha Garden (23 minutes’ drive), Laem Sor Pagoda (26 minutes’ drive) and Samui Cultural Center (six minutes’ drive). 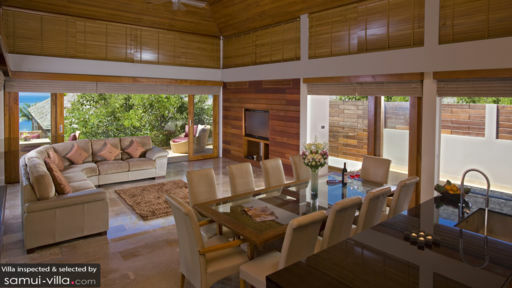 Restaurants, beach clubs and local-style eateries are scattered all around your villa. Taste some of the island’s best seafood dishes at Thong Krut Fisherman’s Village (20 minutes’ drive), feast on organic fare at Sweet Sisters Cafe (20 minutes’ drive), savour French classics at La Cuisine (17 minutes’ drive) or sip sundowners at Nikki Beach Club (10 minutes’ drive).